Rob Marshall took home the hardware as Grand Champion in the National Professional Truck Driving Championships. Rob Marshall did Home Hardware and Team Ontario proud, by winning the Grand Champion award at the National Professional Truck Driving Championships held in Abbotsford last month. Here’s the incredible thing: just weeks beforehand, he was out of a job. The company Rob drove for went out of business, shortly before he was scheduled to compete in the Ontario championships. Rob went ahead and competed anyways, and his skills caught the eye of several fleets that were in attendance. When they learned he was unemployed, the job offers came fast and furious, before he event left the event. 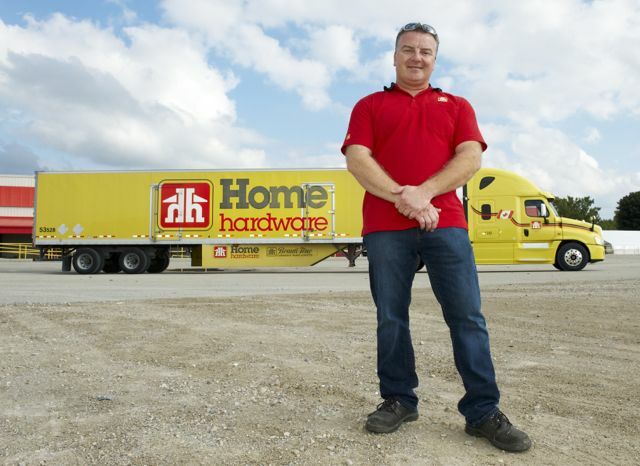 Home Hardware won Rob’s services, and after he won the Ontario championship, they were eager to send him to the Nationals in B.C. There, Rob won Rookie of the Year honours, the straight truck competition and of course, Grand Champion. Congratulations go out to Rob, and to the organizing committee in B.C., who by all accounts put on a stellar event. They lost their last opportunity to host the Nationals in 2009, when an economic meltdown led to the cancellation of the event. Their previous turn before that was in 2001, when the tragic events of 9/11 curtailed the event. It was nice to see B.C. get its shot before waiting the usual seven years in the cycle before the event returned to the left coast.